E. coli as a relative measure of sanitary conditions. Using carefully chosen words, they spoke of the respect for the work of artisan cheese makers and their desire to work with the industry, consumers, government partners, and experts to be sure the right science-based, prevention-oriented standards for food safety are in place. There are a lot of things to like in this statement. Could this be the harbinger of a new age of collaboration? If so, there is hope for a more sensible and effective food safety policy in the works. In stark contrast, the websites of the Department of Agriculture and the Centers for Disease Control are laden with doom and gloom scenarios over raw milk. It seems to be singled out for demonic treatment. Tabloid-style headlines and disturbing first-person video interviews while foods that present greater risk they discuss objectively. Something in milk brings out emotions. These kinds of things are counterproductive to any debate about improving public policy. They are not current with the latest published, peer reviewed science. Their data is incomplete and out of context, the first requirement for analytic statistics. The CDC, which I normally respect, publishes silly Infographics2, restating the obvious. What other results could there be? More sales from states that don’t sell? While deeply disturbing, why single out stories from those who got sick from raw milk and not spinach, or chicken or shellfish, all higher risk foods than raw milk. Any suffering is equally as heartrending. I am aware of the risks and know people who have gotten ill drinking milk or eating fresh cheese from poorly managed dairy farms. Hyperbole only forces people to the extremes, when what we need is them sitting at the table, working together, to find a better solution. It seems the FDA gets this. These changes are coming as a result of the Global Food Safety Initiative (GFSI). The GFSI emphasizes risk analysis based both on calculating probabilities and comparing those calculations to what actually happens. It is pragmatic, and by focusing on eliminating the causes of risks that are happening, and not on the risks that could but don’t occur, it looks to build a more collaborative and less confrontational approach. They have developed a methodology, with the World Health Organization, for assessing risks from foods. It is called “Quantitative Microbiological Risk Assessment (QMRA)” and it is the new gold standard for aligning food policy around risk mitigation. Since it takes into account both probabilistic calculations and empirical data, it is pragmatic, useful and holds great promise. A lot of things could happen, far fewer do happen. In 2013, Nadine Ijaz, MsC, presented the results of her QMRA for raw milk, arriving at the surprising conclusion that raw milk in industrialized countries is a relatively lo-risk food 18 times less risky than fresh spinach. Presented at the annual conference of the British Columbia Centre for Disease Control, it has been widely praised and is being used as a basis for exploring changes in public policy. Before you start writing angry letters, it is one study. We need more. But if raw milk is a relatively low-risk food, why the draconian measures for cheeses made with raw milk, particularly cured ones? The emphasis of the GFSI is good practice, an important first step. There are a few more steps to take beyond GMPs to what could be an exceptionally useful food safety, production, and distribution system. First, we have to address our singleminded dependence on pasteurization as the primary safeguard for milk and other dairy products. To be clear, I am not saying get rid of it. In the right context, it has a significant role to play. But in using it as a cure-all, we are getting in the way of evolution, innovation and real improvement. We are stuck in a 19th century mentality. The incredible advances in manufacturing in other industries occurred because the quality profession changed from relying on inspection after the fact, a downstream solution. I am an expert in Quality. Since the 1930s, amazing improvements have taken place in the quality and efficiency of manufactured goods. These have led to miraculous gadgets we can afford to buy, like the smartphone you carry in your pocket. The big improvements came when they stopped trying to control results and began to look for the causes earlier in the process. We have stopped being curious. Microbiology has evolved well beyond just killing things. A coalition of a few hundred microbiologist recently released what they call “The Microbial Manifesto.” They look at the mysteries of microbial communities, the Microbiome.3 Much of current and future advances in medicine will come from our new understanding of these communities. Why not food safety? How can you compare a dairy with tens of thousands of cows to a family farm that milks a few of their animals using milk warm and fresh from the animal to make their cheese.? Microbiologically these are completely different universes. If you do a search on Google to try and find the studies on which 60-day aging rule was based, you won’t find it easily. In fact, very little is known about it. 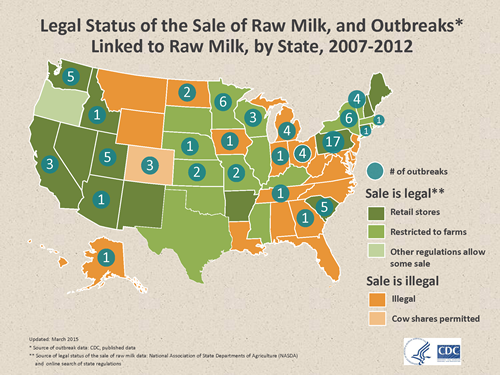 In his excellent white paper, The Raw Milk Beat Goes On: A Look at the Literature and the 60-Day Raw Milk Cheese Aging Rule, William D. Marler 5 quotes sources that “suggest” the source of the 60-day rule, but no one seems to know. Studies done in Brazil by Professor Célia Lucia de Luces Fortes found that cheeses were free of disease-causing agents present in the milk in only 22 days of aging at ambient temperatures, but needed 64 days under refrigeration. The FDA, in keeping with the GFSI, acknowledges that specifying the time of curing may not be the right approach; the best approach is minimizing or eliminating risks through better process.